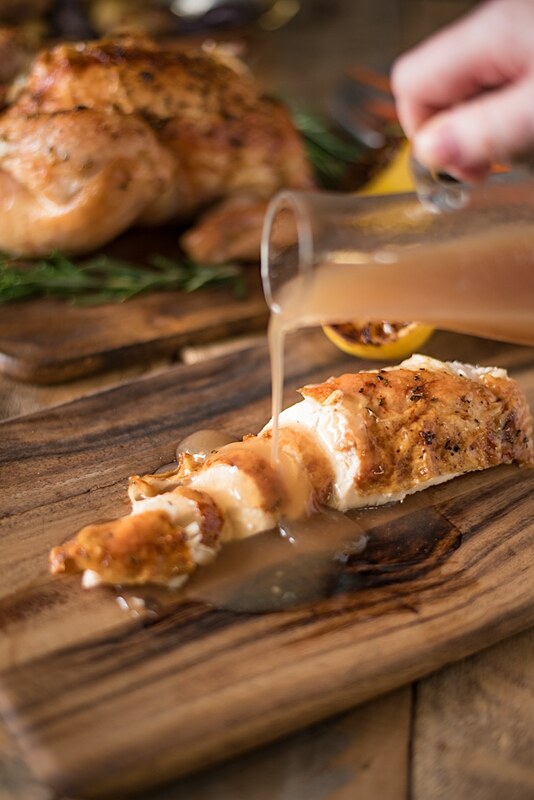 Rosemary Roasted Chicken with Delicious Gravy is everything you want when enjoying a roast chicken dinner. 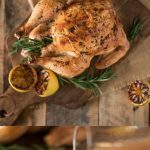 Brushed with butter, fresh rosemary, salt and pepper, the chicken is roasted over vegetables and stock so the gravy is made right in the pan while the chicken roasts. When you serve up juicy and moist sliced chicken with roast potatoes and vegetables, gravy is an absolute must and I’m going to tell you how to get the most delicious and easy gravy without all the work. All you have to do is add carrots, celery, parsnip (this adds a lovely, natural sweetness to the gravy), onion and garlic to a roasting pan, then chicken stock is added. The chicken is set on top of the vegetables and as it roasts, it’s juices drip into the stock and as the vegetables cook, they flavor the gravy. It’s so easy, right? One of my favorite movies is the original The Odd Couple. Jack Lemmon’s character Felix, is roasting meatloaf and their guests are late. Walter Matthau’s character Oscar suggest’s pouring gravy over to keep it warm. Felix says “Where am I going to get gravy from at 8 ‘o clock at night?”. Oscar says, “I dunno, I thought it comes when you cook the meat”. Guess what Oscar? When I make my roast chicken the gravy does come when you cook the meat. Then all you have to do is thicken and check for seasoning. You can see it all come together in the video below. The gravy is thickened with cornstarch instead of flour. Adding raw flour to a sauce (before allowing it to cook in the pan in butter or oil) will result in pasty, flour-tasting gravy. Cornstarch thickens perfectly with no effect on the delicious taste of the gravy. I am a crispy skin eater. Roast chicken, roast turkey, I love them both. The first time I had a deep fried turkey, I just about keeled over with delight. If you are going to roast any meat, you buy a meat thermometer. The cooking times in recipes are only guides because everyones oven is different and cooks at a different rate and the only accurate way to tell if meat is cooked is checking the internal temperature. I talk about this more in my perfect roast turkey post. Chicken is brushed with butter, fresh rosemary, salt and pepper. This is placed in a roasting pan of vegetables and stock that is the basis for the gravy. Dry the skin of the chicken with paper towel. To a bowl, add the butter, rosemary, salt and pepper, mix well. Brush the butter all over the skin of the chicken. Tie the legs together and tuck the wings under the breast. To the bottom of a roasting pan place all the vegetables evenly and pour in the chicken stock. Set the chicken on top of the vegetables. Roast the chicken on a low oven shelf for 40 minutes, reduce heat to 375°F/190°C and roast for 40 minutes more. If the skin is browning to quickly, turn the temperature down sooner. To check for doneness, a thermometer inserted into the meatiest part, just above the leg should read 160°F/71°C. Remove the chicken from the roasting pan, place on a cutting board and allow to rest for 20 minutes. Meanwhile, strain the broth into a fat separator and add to a saucepan. Taste for seasoning, add more salt if needed (this depends on how salty your stock is). Mix 1 tablespoon of cornstarch with 1 tablespoon of cold broth until dissolved. Whisk into the gravy over medium heat and simmer until thickened stirring often to prevent sticking to the bottom of the pan. Slice the chicken and serve with the gravy and your favorite sides. This makes me so happy. This is one of my favorite dinners and the gravy makes the meal even better. Very good, easy to a make recipe. It looks so amazing and delicious. I am trying to this recipe as soon as possible in my home for my family. Thank you very much. Thank you so much, I hope you like it. It’s one of my favorite meals. Now this is what I call a delicious dinner. The only thing we disagree on is the skin eating. I’m afraid that isn’t my thing, but that’s OK because my cheeky husband always eats my portion. A perfect family meal! 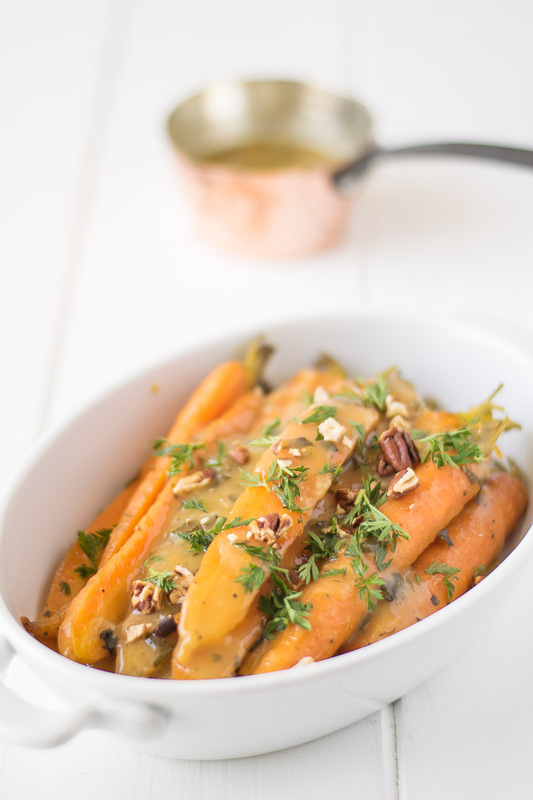 Easy to prepare, delicious mix of ingredients and looks flavorful with the gravy. Super easy! Looks amazing and the whole family will love it! I remember that moment in the movie. Jack Lemmon’s character is so uptight and yet, so funny. 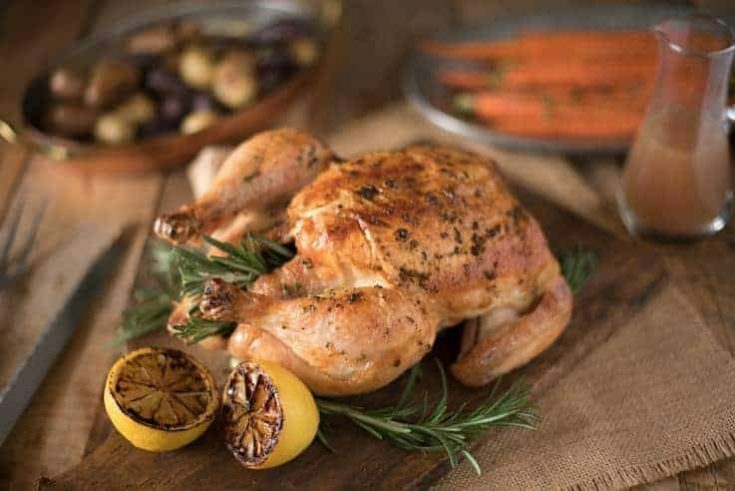 Your Roasted Chicken recipe looks so good and roasting anything with rosemary can make your kitchen very aromatic. I really love rosemary on roast chicken. Especially with some lemon and garlic. This chicken looks so delicious! I love the sound of this 🙂 Will be our next Sunday roast recipe for sure. 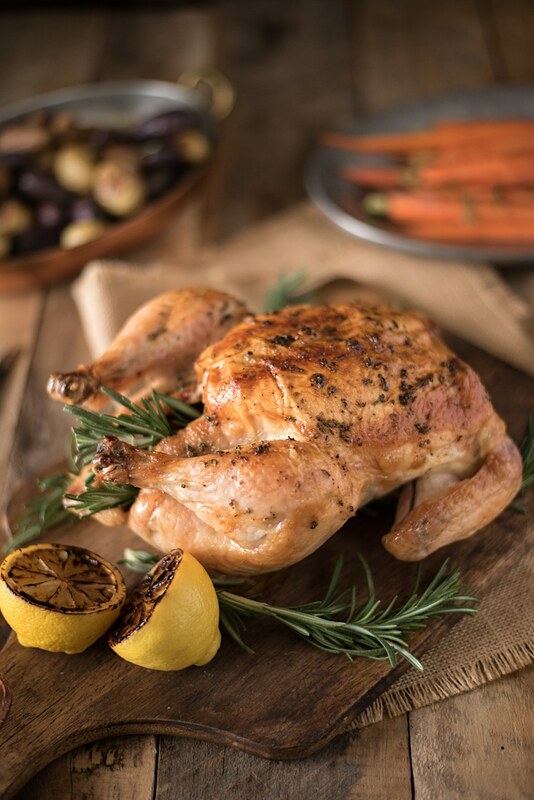 I love Chicken Roast flavored with rosemary – always delicious! I love it when you can make a meal in one pot! This is a delicious chicken Janette! A chicken winner dinner! 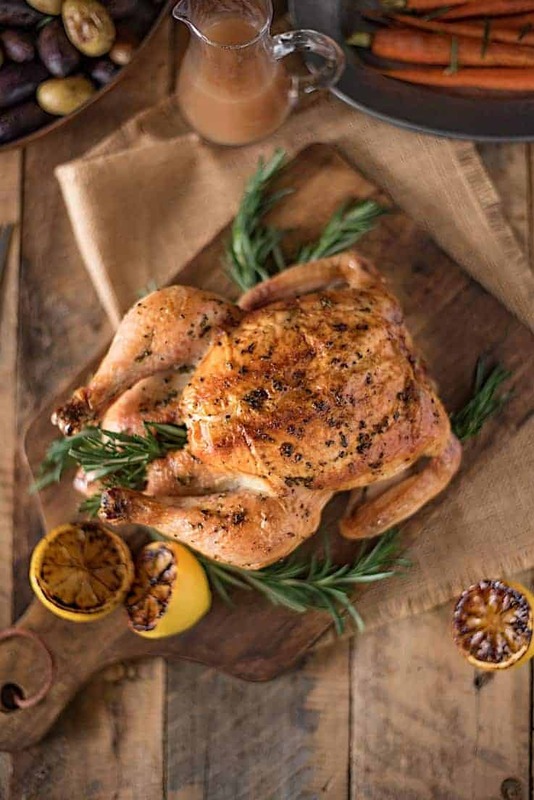 Who can go past a roast chicken this lovely! What a beautiful bird Janette. But I love that you have parsnips in with your veg. Those are so under used in America! Thank you Michelle, that is my mums tip. I also use them in chicken stock and soup, adds lovely flavor and sweetness. Perfect one dish meal! I can totally picture this on the Sunday dinner table with all the family around! Wonderful! I’m so with you on having multiple parts of the meal come together at once. I love roasting chicken because ideally there’s also leftovers to eat all week. This looks delicious! I’ll bet that broth does make delicious gravy. That chicken sounds so tasty and it’s even more healthy with the Rosemary. YUM. A whole roast chicken is on the top of my comfort food list. And the smell that fills the kitchen is hard to be beat as well. This looks delicious.